Shyahwyn strolled down the long, opulently decorated hallway, now that breakfast was done, with her newly appointed staff of advisors. Those who had served the palace faithfully would still be needed, she knew. Her thoughts drifted to many who had mentored her and become good friends over the first few years she had been here. Faces whom she missed very much. "...and the duke's insisting on an audience at your nearest convenience," the older advisor stated, now walking to her left. "He had mentioned several matters that needed to be discussed." Her attention snapped back to the present as she glanced to him and quietly nodded. "Very well." Still trying to remember everything that Lord Borden had just said, she added. "But, inform him that he's to limit his entourage to only five. Apartments are still being reclaimed," her voice trailed off, now considering the full gravity of that statement. He grinned at her and nodded in return,"I'll ensure that his Grace is notified." Tending now to his datapad, she turned to the treasurer at her right as the older woman cleared her throat. "We also have the issue that House Synvari is waiting for a decision on," the more stately, intelligent woman brought up. "Business is on hold until then which could mean billions for Ruusan, if handled correctly." "How would you proceed with that one," Shyahwyn asked, not being that savvy when it came to business on such a scale. "Keep the tariffs small, but ensure that we keep an eye on the books. I can have an auditor visit once every few months to keep an eye on them." Nodding, Shyahwyn returned her gaze to the rich, floral carpet that commanded the center of their journey. "Keep me posted then and let them start working with Corellia. I now the hangar complexes and starport will appreciate another avenue for parts." "Yes ma'am," Eleanor returned her attention to the datapad in her hand and made several entries. "Anything else?" Shyahwyn glanced between them and gained a 'no' from both. "Then I'll let you get on with your days." Bowing to her, they both turned and headed their separate directions, allowing the master to continue on to the end of the hallway, passing several large rooms which had been used over the years for important meetings, entertaining the nobility and private moments between the residents. Discussions with various friends she had made since arriving here from Aargau, so long ago. Exiting the palace, she closed the door behind her and continued toward a modest, two story home which overlooked the lake and verdant hills beyond. A sight that brought a smile to her full lips. Moments locked in time with the shapely master of the dark arts where they would forever stay. Heels clicked off of the stone path which led to the private home of her master and one of her closest friends. The man who found the lost brunette years ago and brought her here to a place of safety for people like them. Not only had he become her trainer, but like a big brother. Reaching the door, she dug into a pocket and removed the passkey, then slid it into the small, lit panel to the right of the door and noticed the red light turn green, allowing her entry. Opening it, she stepped inside Killian's home. Last edited by Shyahwyn; 11-30-2018 at 01:24 PM. She knew better than to enter the house, but the manor had been vacant for so long, Amber took pity on the back garden. With the gate not having a lock, she had taken to coming here every few days to tend to the overgrown bushes, weeds and small plants that littered the half beauty, half useful garden of flowers and herbs. This afternoon, she was on her knees, hair half escaped from her braid, as she toiled over a small cluster of herbs near the center of the garden. They were half hidden in the growing shadow of a set of white rose bushes. The parsley descended did well in the shade, but they were weed choked and the over hanging flora was blocking rainfall as well. A hand reached up to brush back strands sticking to the temples of her dirt streaked face. And as she worked, she hummed a song that was half made up in mind. Periodically, she drew on the well of Force in the small living plants around her and used it to fetch a tool to herself, or move a handful of weeds to a slowly growing pile she had set off to the side near the garden's wrought iron gate. Stopping in her tracks, the sound of a soft melodic humming drifted on the breeze and Shyahwyn turned around and stepped back out into the daylight. Closing the door once more, she rounded the corner of the private home, the palace's west wing looming to her right, and moved toward the garden and large, ancient trees. Following the sound, she soon noticed one of the other few dark jedi remaining and slowed her pace. Glancing around, the witch noticed how overgrown this side of the garden had become. A sight that made her sad. Sighing, she stopped just shy of the bordering white rose bushes, arms now crossed. "Glad someone else's taken the initiative to clean this up. I'd totally forgotten about this end of the Garden," she shook her head. "Just been so busy lately." Most of the central area of the myriad of flowers and plants had been tended to on a daily basis, in the morning, but this end had been forgotten. Apparently the agricultural droids had been so busy with the rest of the immense estate, they had neglected it also. The man known as the Archbishop of the church on Ruusan, well, the former church now as it was pretty much destroyed. As for the rest of it, not counting the floors below it were knocked down and a small entrance to the lower part where Jacob took and gathered things for the Penumbra were intact thankfully. As Jacob walked to Killian's home, the Knight sighed and looked at it. Seemingly abandoned he then heard voices and walked to where the voices could be heard. Noting that Shyahwyn was there along with another young woman he then stopped short and stood behind the Dark Jedi. "Well, as do I. Long as someone is taking care of it." Jacob said to both of them, making himself known, "I come here to seek wisdom. Never go inside...just...thinking that his presence will help guide me in some form." In some way Jacob did find comfort here. Sometimes he could just picture what Killian would say to him in his darkest moments. Especially recently after the bombing of the orphanage and the church in the same day. The Knight still could hear the voices of the dead, children crying and adults screaming in agony. Yesterday, he'd seen them all standing there all in a line right where it happened. Then again, wasn't the first time he'd seen it. But it was one of those times it still made him stand there and stare. Jacob then nodded to Shyahwyn as his orange eyes blinked, "Lady Phoenix. It's been some time." Despite her humming and attentive concentration on the task before her, Amber felt Shy come around the corner. Unless they shielded themselves from the apprentice, she was able to feel the auras of those around the Keep. It had been her self imposed training when there was no Master for her. It was, unfortunately in her eyes, her strongest talent. "Lady, forgive me. I didn't know who resided here. But the comfort of the place seemed to dictate a better looking place of contemplation." She laughed slightly and stood up, brushing dirt from her hands onto her pants. "It just looked like it needed some attention." As Jacob came around the corner, she clasped her hands before her, fingers moving ever so slightly as she used Force powers to bring her scattered tools closer to her into a neat pile she could easily scoop them up. "M'Lord... Forgive me. It seems I'm intruding on the garden on the wrong day. I'll give you two your privacy." She crouched down and began picking up the small cluster of tools she had 'called' to her feet. Hearing approaching footsteps, she glanced back to see Jacob and nodded to him, "And you, archbishop." Glancing beyond him to Killian's private home, she had to agree. "So do I," she replied with a hint of longing, then turned back to Amberlyn as she rose and began apologizing to them. Unsure why the deference, Shyahwyn grinned. She had been there once herself, she mused. Being nervous or intentionally avoiding those of note when she first arrived had been habitual, back then. Except for Kilian and Invictus, whom she also missed a lot. "No need for you to run off," Shyahwyn shook her head. "I'm glad that you're taking the time and this morning seems to be one good for a small gathering," she glanced to Jacob, then back. "I've had a lot on my mind lately and it would be nice to have your inputs." Knowing Jacob had a lot on his plate also, the master turned to face them both. "This palace has grown quiet lately. I just had a conversation with two of the palace advisors and they've suggested cleaning out several of the apartments in the west wing for future guests," she informed, then eyed Jacob. "I know there are a few others that still train with and live among us, but too many of the residences here have grown stale from disuse, so I didn't argue with them." Green eyes drifted to Killian's home. "But not all of them." Drawing in a deep breath, she sighed and returned her attention to her fellow dark jedi. Last edited by Shyahwyn; 12-02-2018 at 02:12 PM. Jacob sighed at the mention of his public title on Ruusan, "I'm no Archbishop at this moment. Can't be one without a church, right?" The Knight stepped closer till he was within a few feet of both Amberlyn and Shyahwyn. Looking to the garden itself as Shy did he then dismissed Amber leaving. There was no need, in fact, he was the one intruding their conversation. But, he was just unsure of who it was before he saw it was fellow Dark Jedi. He thought it might be those who destroyed his church and the orphanage next door to it. Looking at his mentor's home, he missed him being there, as he did his first teacher Invictus. They both helped shape him into what he is now. If only they could see it. Nodding his head agreeing with Shy he smiled, "Agreed. As have I and I'm sure it has traveled around what happened recently. Though I may not be referring to what Lady Phoenix may be speaking of...but...I believe we all have something to talk about." Listening to Shy speaking about the palace growing quiet lately he nodded, agreeing with that statement. When she mentioned cleaning out apartments for future guests he couldn't agree more with it. It was growing dusty in places and disuse of such things would make it an eyesore. No one needed that he was quite sure of. Once she spoke of those still living among us and the residences being stale and such he knew that things would have to be renovated if they wanted others to enjoy being here. Well, obviously ones who were part of the Penumbra like them. "I know what you mean." Jacob said looking to Killian's home with orange eyes and then to the two ladies, "Not all would agree. This place stands as a tribute...I could never let anything happen to this place. Shy, you and I both have a lot to thank Killian for. Just as much as Invictus. I couldn't bare to watch the bricks fall from renovation...least of all this place." Amber stopped mid pickup as they both agreed she was welcome. But her eyes gave away her surprise at being asked to stay because her ear was wanted as well. "I can understand the need for airing. It's not just students we lack, but teachers as well. Mine left on a mission some time ago and has yet to return. Which is why I practice what I know in here." Her jaw tightened a moment to betray her short flare of anger at being abandoned. But then she dampened it. The Force called, they answered. She knew that's how it worked. But it didn't mean she had to like it. As Jacob denied his title, she shook her head and took a step towards him. "That's not true, Archbishop. Your title remains regardless of the stone building that sheltered you. After the explosions and loss of life, you are needed more than ever. Whether it's in a dining hall when somewhere can't stomach lunch with the memories crowding them. Or even out here with us." She nodded to herself and the Lady. "Do you not think the Force placed you in your position because it's where you can help most with your gifts without revealing your true identity?" She wasn't sure how that came from her, but it had seemed right. She glanced at Shy and smiled. "And I know this house means a lot to many people. I do not believe anyone would say to destroy it. And I'd be happy to help in any way I can. Even if it's just listening, Lady." She smiled again, her moment of anger gone with a blink. Not recalling much of Jacob's history with the place, she was glad that she wasn't the only one that hated to see anything happen to the Quane residence. They would have to go through her to change anything in or around that apartment, she knew. Turning to Amberlyn, she listened and understood the sentiment. "As long as the archbishop and I are here, you have mentors and teachers." Though she realized after that statement, she was being a bit presumptuous, but also knew him well enough that he wouldn't argue with her statement. "And I appreciate any help you can offer around here." Scanning the garden behind and beyond them, "I've tended to a small part of this garden and tended to the things I've planted over the years, just haven't had time for the whole thing." She grinned knowing it would take days to do that as well. "Though that would be a fulltime job too." Jacob had to hand it to Amber she had a point, and with that he smiled for a second, "You are quite right on that. Thank you. Wise words from someone in the beginning of their journey." Looking to the residence of Killian and then to the two ladies he then nodded his head as Shy mentioned that as long as they were here that Amber had someone to teach her. Even if there were hardly no others to do so, Jacob would find the time when he could to help her. That is what was his duty as a Knight within the Penumbra. Train those who could pass on what knowledge he had to the next generation. He would help tend to the home of his mentor and would put any money he could into keeping it in top form. Everyone within the Penumbra knew he had money, thanks to great investments and a small fortune his parents left him. 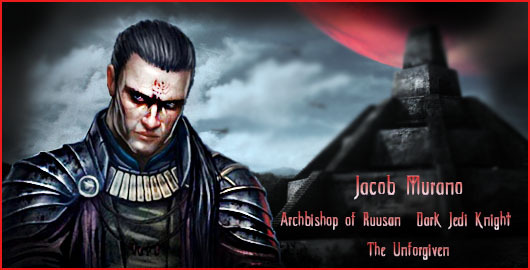 Jacob had turned it into something bigger through the years. Now he'd probably have to spend it all to rebuild everything he had here. If it was to be then it was to be. "I can help in any way I can." He said to Shyahwyn's statement on teaching, then said looking to the home, "I can put any funding if I can into this place. If I don't spend it all rebuilding the church and orphanage." "God dad, cut your hair you look like a chick." Renee strolled up them giggling. Seeing the two others there she nodded to them both before walking up next to her dad. Not knowing who they were she smiled at them before nudging her dad then smiled at him. Now that they were both on the same side she was now herself. Not hiding who she was anymore, and even though she missed her mom and her twin brother, Jacob Jr. she knew that they'd be okay. Hopefully. Renee was also much like her dad, stubborn, and had a temper when it came to the surface. But now she finally understood why her dad did what he did and she accepted it and now she could have a better father and daughter relationship. Though, she was now a young woman just as her brother was a young man now. Both were 19 now. Jacob Jr had already had his study of the Force under his belt, and Renee was pretty much beginning her own. No matter though she was going at the pace she wanted to. There wasn't a need to rush. Renee studied better like that anyways and she was having fun with it, as her mentor would say. It was sad that she wasn't around though lately. But, Renee wouldn't dwell on it. She figured it would be good to see if her dad was alright and socialize with fellow Penumbra members. Better them then the snobby nobles here on Ruusan. "What's everyone talking about?" She asked. Her vision shifted from one to the other then to the woman who fairly bounced into the small gathering. Her comment about Jacob's hair made her smile. Before she thought, she blurted out, “I like it that way. It suites him.” She smiled. She had seen Renee around, but they hadn't really met. “Hi, I'm Amber.” She waved a moment then let her hand drop. The ideas of how to improve the garden, and to continue and maybe move forward, in her training were swirling in her mind. And to think... she almost hadn't come here this morning. Shyahwyn recognized Renee as she joined them and nodded, smiling to the archbishop's offspring. Chuckling at the comment about his hair, she enjoyed the lighter mood offered, especially after this morning's meeting. Returning her gaze to Amberlyn, she nodded knowing that a few more dark jedi in residence also had a lot to learn and be able to continue their training as well. Renee being one of them. Turning slightly, allowing Renee to join them in the forming circle, "Things that needed to be done to help our group continue on. With so many names having left or disappeared, there's still a lot of work to do and only a few of us to do it." Head canted slightly to the right as she took in Jacob's daughter, "Did you have any ideas or input?" Hearing his daughter Renee come up and stand beside him and he then chuckled shaking his head, "Hey it doesn't look that bad!" Then hearing Amberlyn speak he noted and understood what she meant. There were many who came and gone and Jacob was sure the group would sometime return to where it had been before. It was just a matter of time. As she mentioned that just a few things on the exterior would be needed he took note of that as well. Decorations and bushes and such would be a good addition to it. Lot of the plants and stuff looked dead or near it to him. But, that could just be his view. Once Amber said she liked his hair the then nodded to her then his daughter. "See, someone likes it." He said with a smirk to Amber then stuck his tongue out at Renee. As for what Shyahwyn said he then nodded, taking a serious tone again, "There is quite a bit of work. But, it'll take time before we return to what we were." Amber was excited that Shy would take her back for training. She had been working hard, but on her own she hadn't progressed past enhancing what she already knew. It would certainly be great to move forward. She was anxious to learn more and eventually progress enough to teach others. When Jacob smiled at her with her agreement to his hair, she laughed. Seeing him stick his tongue out at Renee made her bite her lip to fall silent. She didn't know Renee well enough to want to upset her accidentally. But then talk returned to the house. And Jacob's comment about returning to what they seemed to cover more than just the house they stood beside. "You know, if you guys want to help now, I still need to finish weeding in here. Cook likes the herbs I had been bringing from here. I was hoping to unchoke them enough to get snippings from them in the next few weeks to have replanted to Cook's garden so she could have them whenever she wanted." She wasn't sure how well it would work this late in the year, but it was worth a try in her mind.